Moss - a wonderful gold, green colour from Landscape dyes on Moda Vera Linen Mode and a skein of "Natural white Merino ultra soft boucle yarn in 100g skeins" from Virginia Farm. 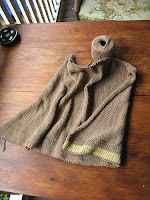 The boucle shows the true colour despite the linen blend simmering in the dyepot for about half an hour. I got tired of waiting for the dye to exhaust so I popped the merino yarn in for a few minutes while I rinsed the linen out. The results were impressive - it really does live up to its "dyes beautifully" description. The reason why I was dying the Moda Vera was to get an alternative to the lime that was the only green shade Spotlight had in this fibre. It wasn't as successful as I would have liked but I can still use it to complement the taupe shade I'm using to knit this loose-flowing swing cardigan. Big needles, simple pattern and budget price yarn. On the other set of needles I am nearly finished another swing cardigan - this time in lovely silky-soft, Atlante bamboo yarn from Naturally. It's 4ply and very slippery so its not a relaxed knit - I have to ensure my tension is constant as it doesn't allow for any mistakes or variations. 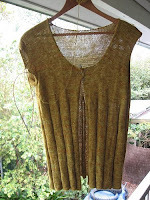 the end result is worth it though - a slinky, cool summer top in rich Gold. The other colour adventures we are having are Royal Blue. The Boy Bowerbirds have been practising - even though they are still without their mature, deep-blue plumage they've been dancing and preening, building bowers and collecting bits of blue booty. The bowers are a bit scrappy, their dances and songs obviously need a bit more work and all their booty is constantly being pinched by the adult bird, but they keep on trying. One of these days they'll be off their 'P Plates' and doing it for real. In the meantime we get a lot of entertainment watching them rehearse. Watching the bowerbirds would, indeed, be fun. Nice dyeing and knitting projects. Sorry to be the bearer of bad news but I've just looked up the composition of your Moda Vera yarn & the reason it didn't dye very well is because Landscape dyes can't dye plant fibres, the colour that you have acheived is just a stain & will likely wash/fade out over time. You will need a fibre reactive dye (such as procion MX or Drimarene K) to dye it properly.